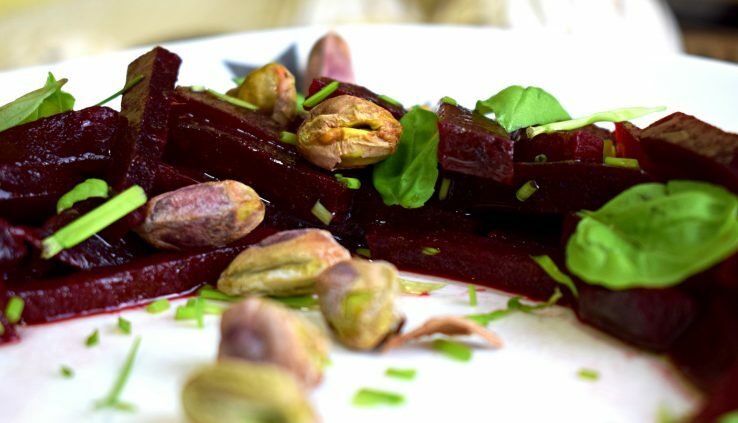 Simple beet salad refined with pistachios. The deep red of the beets is accented with brilliant green chives and basil. I got a food delivery that included a lot of red beets. Usually, I’d jump to making a stew, or soup, but I already had my mains for dinner planned. I took the chance to create a red beet salad, something I haven’t done in a long time. The basics of the salad are always the same: cook the beets, chop, add oil and vinegar. Unfortunately, I was having a hard time getting a decent photo of this, even with the added green herbs. Something was still missing. I decided I’d try adding some nuts to the plate. The irregular shape of pistachios was a nice contrast to the blocky beets. After the picture, I had a taste and was pleasantly surprised at the combination. Thus, my red beet salad has pistachios. You can probably add two, or even three times as many nuts. I stopped at what seemed like a minimum amount. Not every bite will include a nut, providing varying textures as you eat. Yes, I think about the composition of spoonfuls when I cook. Slicing the beets, I try to imagine how many pieces will fit on a fork, and how they’ll feel in the mouth. If it’s too big, you’ll get only a single boring piece, and if chopped too fine you’ll no longer notice the nice beet texture. Getting a feel for this can greatly improve your cooking. Now, go and slice those beets into a lush red salad.